Cheapest around in this special edition colourway. You missed it for £108 at Amazon 2 days ago, mine arrived yesterday! I know. I missed the deal. Been keeping an eye ever since and this is the cheapest it's going down to. And the cheapest its been (aside from on Black Friday). I doubt it will go back down to that price again before Christmas at any time. So at the present time, this is the cheapest deal. I know. I missed the deal. Been keeping an eye ever since and …I know. I missed the deal. Been keeping an eye ever since and this is the cheapest it's going down to. And the cheapest its been (aside from on Black Friday). I doubt it will go back down to that price again before Christmas at any time. So at the present time, this is the cheapest deal. £130 - where does Fitbit get its pricing from..........Apple!!! Yes I ordered it on the BF deal . Hope the strap is good as its the only difference between the standard Charge2 and the "Special Edition " . Yes I ordered it on the BF deal . Hope the strap is good as its the only …Yes I ordered it on the BF deal . Hope the strap is good as its the only difference between the standard Charge2 and the "Special Edition " . 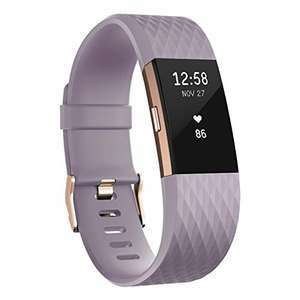 "With a hand-polished mirror finish, this 22k rose gold-plated tracker accentuates a lovely lavender band."